The focus group has got a lot to answer for. A small number of people gathered in a room and asked leading questions about their purchase experience and how it could be improved. It’s to blame for the dealer who keeps offering to service a car you no longer own, or the offer of a test drive of a car you’re not interested in. Pointless information bombardment. Not helpful, is it? Yet focus groups have defined marketing and sales strategy, and car brands are basing their assumptions of consumer behaviour on learnings that are often decades old. But this is a digital world now, people. Amazon Prime, Uber, Netflix and others offer near-instant gratification. Received wisdom used to say that cars would never be like that. Too expensive and important to be subject to impulse purchase or recommendation. 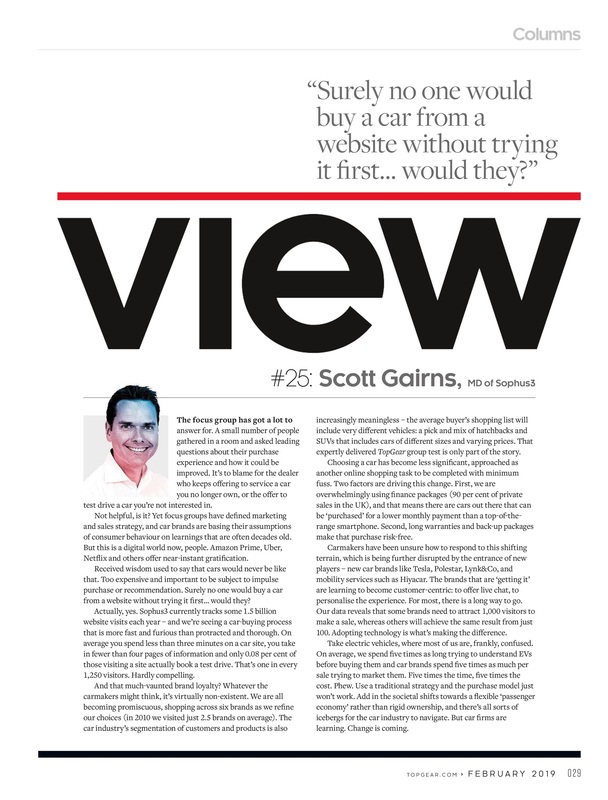 Surely no one would buy a car from a website without trying it first… would they? Actually, yes, they will. Sophus3 currently tracks some 1.5 billion website visits each year – and we’re seeing a car buying process that is more ‘fast and furious’ than protracted and thorough. 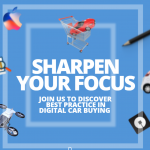 Some stats that support this: on average you spend less than three minutes on a car site, you take in fewer than four pages of information and only 0.08 per cent of you visiting a site actually book a test drive. That’s one in every 1250 visitors. Hardly compelling. And that much-vaunted brand loyalty we keep hearing about? Whatever the car makers might think, it’s virtually non-existent these days. We are all becoming increasingly promiscuous, shopping across six brands as we refine our choices (in 2010 we visited just 2.5 brands on average). The car industry’s segmentation of customers and products is also increasingly meaningless – the average buyers’ shopping list will include very different vehicles: a pick-and-mix of hatchbacks and SUVs that includes cars of different sizes and varying prices. That expertly delivered Top Gear group test is only part of the story. Choosing a car has become less significant, approached as another online shopping task to be completed with minimum fuss. Two factors are driving this change. First, we are overwhelmingly using finance packages (90 per cent of private sales in the UK), and that means there are cars out there that can be ‘purchased’ for a lower monthly payment than a top-of-the-range smartphone. Second, long warranties and back-up packages make that purchase risk-free. Car makers have been unsure how to respond to this shifting terrain, which is being further disrupted by the entrance of new players – new car brands like Tesla, Polestar, Lynk&Co, and mobility services such as Hiyacar. The brands that are ‘getting it’ are learning to become customer-centric: to offer live chat, to personalise the experience, draw people in. For most there is a long way to go. Our data reveals that some brands need to attract 1000 visitors to make a sale, whereas others will achieve the same result from just 100. Adopting technology is what’s making the difference. Take electric vehicles, where most of us are, frankly, confused. On average, we spend five times as long trying to understand EVs before buying them and car brands spend five times as much per sale trying to market them. Five times the time, five times the cost. Phew. Use a traditional strategy and the purchase model just won’t work. Add in the societal shifts towards a flexible ‘passenger economy’ rather than rigid ownership, and there’s all sorts of icebergs for the car industry to navigate. But car firms are learning. Change is coming.